Sable *in context* means black, and other crafting annoyances. When I received Ami Ami Kittens as part of the Cannonball Book Exchange I was super, duper excited. I had put it on my Amazon wish list as a kind of “hm… this craft looks fun and I think I would like to learn more” kind of thing and wasn’t much more motivated to pick up the craft then that. And then it arrived in my book exchange and I got excited, because it gave me an excuse to try it. For the record, I’ve been crocheting for about 20 years and in that time I’ve made blankets, scarves, hats, doilies and one partial tablecloth (I swear, I’m working on it). However, making little dolls? Well, that’s new to me. As an avid cat fanatic, Ami Ami Kittens seemed like the perfect place to start. This misconception was quickly dispelled when I opened the book and started reading. 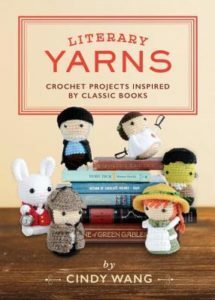 It very quickly became clear that I was gonna need another book to help me start this craft, and so I got my hands on Literary Yarns and got started there. From the many projects in Literary Yarns, I chose to start with Hester Prynne. The Scarlet Letter has been a favorite book of mine for a long time, and Hester seemed like one of the less complicated projects. The instructions here were very clear, and while I have thoughts on the various mistakes I made during the crafting, I have only my inexperience with the craft to blame for that. I still have a couple of issues with the book though. For example, instead of a page with a depiction of each crochet stitch (something most crochet books have) the book directed you to a website and advised you to be familiar with crochet. The website was helpful, but I didn’t really appreciate having the book out, the project in my hands and then discover that I needed to access a website in order to figure out how I was supposed to decrease the stitch. This doesn’t make the book a bad book, but it does make it one that isn’t for beginning hookers. I also need to give a shout out to the ladies in the Pajiba Yarn Wall Facebook Group, who helped me with the eyes. I didn’t want to get the plastic eyes recommended in the book (and I don’t do hot glue guns, at all), and those ladies gave me some options, including a knot that that I ended up using and I wish had been an option in the book. Finally, and here’s where I get pedantic, the line is “On a field, sable, the letter A, gules”; meaning a red letter A on a black background. The directions wanted you to do Hester’s dress in brown. And while that’s valid, as the ‘field’ could be a patch instead of the whole dress, for a small doll you’re not going to do a patch like that. So I rebelled and did Hester’s dress in black. You guys, I love her. I love her so much. Overall, the instructions were easy to follow, and I’m excited to try my hand at a few more literary figures (and adapt a few patterns to make other dolls). I’m a rebel and changed not only her dress color but her bonnet as well. esired. The first problem I have, and this is a me problem, is that the patterns are diagrams and not written out in the manner that I am used to. Fortunately there is a section that tells you what each symbol on the diagrams represents and so I was able to figure it out. Ok, I just wrote out the pattern using the diagram as a guide. I’m not super happy with some of them, I had trouble with the ears and nose especially. The patterns in diagram form might have been a blessing in disguise though, as the written instructions were…. unclear. As I gave the book a more thorough look over, I realized that it was translated from another language and my suspicion is that the translator is either not familiar with crochet at all or does not know English crafting terms well enough to do a good translation. It’s the only thing I can think to explain directions that say “take the thread and pass one end through the hole of the needle…” Instead of “thread the needle”. Some of the instructions read more like they were passed through google translate then translated by a human who understands enough about crafting to be proficient in both English and the original language. Another example of this misunderstanding comes from the materials suggested area. Yarn is simply listed as “crochet yarn”, now you may not know much about crochet or knitting, but I want you to understand that this is basically saying “welp this uses yarn” and as the weight (size) of the yarn is fairly important for the size of the finished craft this instruction is less then helpful. Fortunately I had the other book, and I filled in a lot of blanks using the experience I had from making Hester. Despite some struggles, I managed to make a kitten I’m relatively happy with. I again went off script for the eyes, so the fact that I’m not happy here is entirely on me. But I’m blaming the uneven ears and the crooked muzzle on the pattern. The muzzle was 100% straight when I embroidered the nose, so how did it end up crooked when I sewed it to the head? I have no idea. Over all, I had a lot of fun delving into these books. 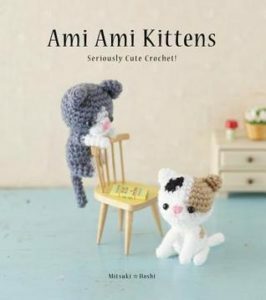 I am excited to try more patterns from Literary Yarns, and I will likely return to Ami Ami Kittens at some point. I would like to make a more accurate representation of my cat, for example. Anyway, thank you to Teresaelectro for jump starting me on this crafting path, it’s going to entertain me for quite a while. Share the post "Sable *in context* means black, and other crafting annoyances." Thank you for this thorough review. I’m a little appalled the book didn’t have the stitch diagrams. I usually end up on the web anyway for video assistance, but I wouldn’t like craft publishers to get out of the habit of including the illustrations. Sometimes, the illustration is enough. One of these days I’m going to learn to crochet, solely to make little toys like this! Oh you should. It’s very fun. And I’m really happy with my little dolls. Hi, could you advise which type of yarn you used. My daughter is also struggling with this book. For the piece from AmiAmi kittens? For the one in the picture I used something that’s about sock weight. However, I’ve also made another cat from this using worsted weight yarn and it turned out ok. I don’t remember what hook size I used, but I believe I used a D hook for both projects. Something I have learned is that you want to use a slightly smaller hook then you would think for the yarn weight, but honestly it’s not really that important. Yarn weight will only change the finished size (smaller weight yarn will give you a smaller finished product, etc). The thing I’ve learned that matters most is how tight the stitches are, as a tight stitch prevents gaps in the finished product.